Are Bicycles a Plot to Surrender the United States of American to UN Control? One of the most unfortunate aspects of transportation policy in the United States is that it winds up playing as a “culture war” issue. “This is all very well-disguised, but it will be exposed,” Maes told about 50 supporters who showed up at a campaign rally last week in Centennial. Why choose the new I-35W Mississippi River Bridge? Carrion-Madera, Carlos and David Levinson (2010) Why choose the new I-35W Mississippi River Bridge? On September 18th 2008, a replacement for the previously collapsed I-35W bridge opened to the public. Consequently, travelers were once again confronted with the opportunity to find better alternatives. The traffic pattern of the Minneapolis road network was likely to readjust, because of the new link addition. However, questions arise about the possible reasons (or components in the route choice process) that are likely to influence travelers crossing the Mississippi, who had to choose among the bridge options, including the new I-35W bridge. Using GPS data and web-based survey collected both before and after the replacement bridge opened, a bridge choice model is estimated using weighted-least squares logit. 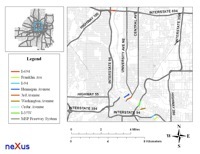 In this way the proportion of I-35W trips can be estimated depending on the assigned values of the explanatory variables, which include: statistical measures of the travel time distribution experienced by the subjects, alternative diversity, and others. The results showed that travel time savings and reliability were the main reasons for choosing the new I-35W bridge.